"Fans of ambient music will no doubt be familiar with the work of Mathias Grassow and Tomas Weiss, Grassow being among the most well known and prolific genre artists of the last twenty years, and Weiss being responsible for founding a number of labels and communities supporting a variety of different electronic styles, as well as releasing his own impressive music. Given their individual histories, when I heard that the two of them were working on a collaboration, I became quite interested to see what they came up with. 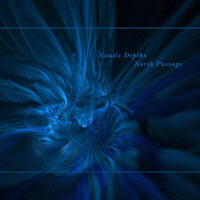 Needless to say, I'm pleased to report that the resulting project Nautic Depths lives up to all my expectations with the impressive release "North Passage". Presented as a single long form piece divided into indexed passages, "North Passage" is a fascinating and engaging release that I am most impressed with. "Norvegia" opens the disc, a low drone bed with occasional sounds overtop, a very beautiful atmospheric piece that brings to mind the Nostromo disc by Sleep Research Facility. Very dark and somewhat ominous, "Norvegia" is inspired in its approach at conjuring a dark atmosphere. The transition into "Arkona" is nearly imperceptible, but as time passes it becomes clear that new elemements have been added to the sound. A haunting call, a deeper drone, we've clearly entered new territory but it all feels to be part of the same journey, a logical step in our travels. "Mercury" flows along in a similar vein, though there is a slightly denser feeling of higher tones and sounds, a slightly more "active" feel to the track. "Astrolabe" shifts the sound considerably, a sudden change to a warmer steady drone which comes across as somehow more inviting. It's an interesting study in aural dynamics, the way the listener hears different elements to the tone as it progresses, nuances in sound that are subtle at first but gain a greater significance as time goes on. After the relative warmth of the previous track, "Fram" brings us back to a particularly cold and dark space, where the feeling of isolation becomes particularly obvious. Other tones are heard on the edges of the soundfield, but nothing so clear that it can be identified or recognized, adding an element of fear to the proceedings that benefits the listening experience. "Aurora" closes the disc, once again returning to a sparse and simple drone, steady, dark, ominous. It ends slowly, quietly, gradually, done in such a way that you don't even notice it's over until it's done.